The North York Moors has one of the largest expanses of heather moorland and it became a National Park in 1952 and covers an area of 554 square miles stretching from the Derwent Valley to the Cleveland Hills just south of the Tees. The sandstone and limestone hills have formed a rugged landscape with wide heather clad moorlands on the open tops and pretty farming communities and villages in the many sheltered valleys many of them hidden away. To the north and west the moors are defined by the steep scarp slopes of the Cleveland Hills on the edge of the Tees lowlands to the east the moors are clearly defined by the impressive cliffs of the North Sea coast and to the south by the broken line of the Tabular Hills and the Vale of Pickering. Helmsley is a lovely tourist market town in North Yorkshire. There are plenty of shops, cafes, pubs and restaurants to go at. Market day is held on every Friday in the square where Sir Giles Gilbert Scott’s gothic memorial to the second Baron of Feversham and a stone market cross dominate. Hemsley has a ruined castle dating back to 1120 when then it was a wooden fortress. In 1186 Robert de Roos began to convert it in to a stone castle, he added 4 towers to the south side and a main gateway. When he died 1227 his son William who lived there for 31years only added a chapel in the courtyard. The next William to inherit in 1285 built a new hall, kitchens and reinforced defences. He then divided the castle into two parts, north and south. In 1478 it was sold to Richard, Duke of Gloucester, then after the Battle of Bosworth it was returned back to now Edmund Roos by King Henry V11. Edmund died 1508. The castle then went to Edmunds cousin, Sir George Manners it then went through many generations before alterations were made. The 3rd earl of Rutland converted the hall into a Tudor mansion house and the chapel into a kitchen and the new hall was demolished. By 1632 it passed into the hands of the 1st Duke of Buckingham. In 1644 it was then besieged by Sir Thomas Fairfax who, after the battles of the English Civil War, dismantled most of the castle and only the Tudor mansion remained. Then the 2nd Duke of Buckingham took up residence, he died in 1687, and was then sold to Charles Duncombe and then passed to his brother in law Thomas. Thomas did not like the castle so he hired Sir John Vanburgh to build a mansion at nearby Duncombe Park. Helmsley castle soon fell into decay and is still owned by the Duncombe family in the care of English Heritage. The Walled Garden, open to visitors, was built in 1756 and this five-acre landscape, set against the backdrop of Helmsley Castle and Duncombe Park, is being restored back to life. Duncombe Park, just near the bridge over the River Rye, is an estate and parkland designated a National Nature Reserve and is one of the finest restored houses in Yorkshire, another great place to visit. Also in Helmsley just near the castle there is part of the Cleveland Way to Rievaulx Abbey, which is a Gothic ruin. This walk is approx 3 miles each way. Bilsdale, lying between the viewpoints at the top of Clay Bank to the north and Newgate Bank to the south, is a beautiful dale of scattered farms, grass land bounded by dry stone walls and native and conifer woodland. The spoil heaps at 900ft are the result from jet mining in the dale. Most of the moorland around Bilsdale is open access land with many paths and tracks to follow from easy to the more challenging whether walking, cycling or horse riding. Chop Gate, locally pronounced Chop Yat and meaning Pedlers Way, is a small village set in the Bilsdale valley within the North York Moors National Park. It is an idyllic village with stunning views across the valley to the Cleveland Way. Situated on the B1257 between Helmsley and Stokesley the village houses a pub the Buck Inn and a car park with public toilets and an information board. Just a little further up from the pub and opposite the War Memorial is the Cold Moor Lane which starts off as a narrow over grown bridleway to soon opening up to the wonderful scenic countryside over the hedges on either side. The bridleway then continues over Cold Moor, on the west side of Bilsdale, to the Cleveland Way where the Wain Stones are situated just below the top of Hasty Bank. Hasty Bank is a hill in the Cleveland Hills range at the northern end of Bilsdale. The Cleveland Way National Trail crosses Hasty Bank and is also part of Wainwright’s Coast to Coast and the Lyke Wake Walk. A large distinctive rocky outcrop known as the Wain Stones lies at the western end of Hasty Bank just below the summit. Due to the rocks exposed position there are the signs of heavy erosion where weaknesses and cracks in the rocks have been worn away over the centuries by wind, ice and rain. It is said if you listen carefully on a windy day you can hear the wind wailing as it blows between the jumbled outcrops. These impressive sandstone crags are the largest such group in the North York Moors and very popular with walkers and climbers. Many climbers come to climb the twin pillars of the steeple and the needle. From the summit there are superb views north across to Middlesbrough and the Tees. Roseberry Topping and Captain Cooks Monument can also be seen. Urra Moor to the north east of Bilsdale is the highest moor in the North York Moors at 454 metres (1,454 ft). Urra Moor applies to the moor as a whole, the actual summit is known as Round Hill. The moor is noted for its prehistoric remains and has a number of barrows and carved rocks including some cup and ring carvings. The most striking relic is the Face Stone, a stone of about a metre in height into which has been carved the shape of a face. The Cleveland Way was opened in 1969, the second National Trail to open in England and Wales, and follows a horseshoe line for 109 miles taking in much of the wonderful North York Moors National Park. The route starts in the market town of Hemsley and heads across the heather clad moors, through woodlands and dales to reach the coast at Saltburn where it then heads south along the dramatic coastline for 50 miles along rugged paths passing through old fishing villages and pretty coastal resorts and towns to Filey. The Cleveland Way also passes through many features of history and heritage such as Hemsley Castle, Rievaulx Abbey, Mount Grace Priory, Whitby Abbey and Scarborough Castle just to name a few. We turn left out of car park entrance and walk on along the road using the pavement past the pub. At the memorial on the right we turn left and immediate right onto Cold Moor Lane. We keep following the track straight forwards uphill going through the gates until we come on to the open heather moor. There are a number of paths but we just keep heading forwards towards the top of the hill. After passing a large cairn we soon pass through a wall and within a very short way we turn right off the track and follow the distinctive path downhill and then uphill to the rocky outcrop of Wain Stones. We are now on the Cleveland Way and follow it over the top of the stones and along Hasty Bank. We come to the top of White Hill and the track starts to bear right. We soon start making our way downhill to the road where we cross straight over and keep following the Cleveland Way uphill. At the gate with a seat and a sign post at the other side we turn right and follow the bridle way over Urra Moor which bears left then right downhill over a stream. We follow the bridle way uphill then it levels out. We keep heading forwards ignoring a path going off to the right. We come to a wall corner and keep heading forwards with the wall on our right. Just before the next sign post we turn right downhill then turn right through the gate. We follow the bridle way downhill to the farm. We turn left at the farm onto the minor road going downhill to cross over a bridge to the main road. We now turn left and follow the road using the pavement back to Chop Gate and the car park. This is a moderate walk on good well established footpaths and tracks mainly over the moorland with some inclines and declines. There are some short sections of road. Elevation: Approx lowest point 156.80m (514.50ft) approx highest point 398m (1305.80ft). 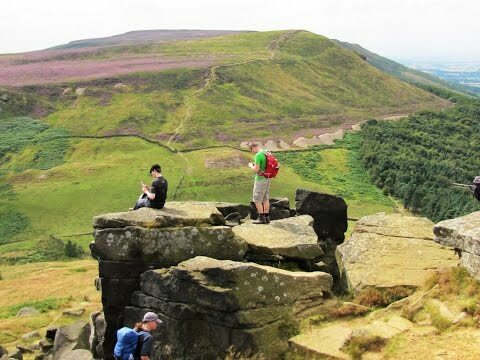 Approx 7.9 miles allow 3½ to 4 hours using OS Explorer Map OL26, North York Moors, Western area. Start point: Chop Gate village hall and car park on the left just before the village. Chop Gate situated on the B1257 Helmsley to Stokesley road in the North York Moors, North Yorkshire. From the A19 at Thirsk take the A170 via the steep incline of Sutton Bank to Helmsley. OR From the A64 at Malton take the B1257 into Helmsley. In Helmsley turn left at the roundabout then right at the t-junction onto the B1257 for approx 12 miles to Chop Gate. The village hall and car park is on the left before the village. From Pickering take the A170 to Helmsley. In Helmsley go over the roundabout then right at the t-junction, then as above. Parking: Chop Gate car park £1 for all day. There are toilets in the car park at Chop Gate. For Refreshments there is the Buck Inn at Chop Gate. There is another pub the Sun Inn on the B1257 near Fangdale Beck between Helmsley and Chop Gate and there are two pubs at Great Broughton near Stokesley. The next nearest public toilets and ample facilities are at Helmsley and Stokesley. It was nice to meet you on the Wainstones this Summer. Now following your excellent website.